ETC's Ruff?? 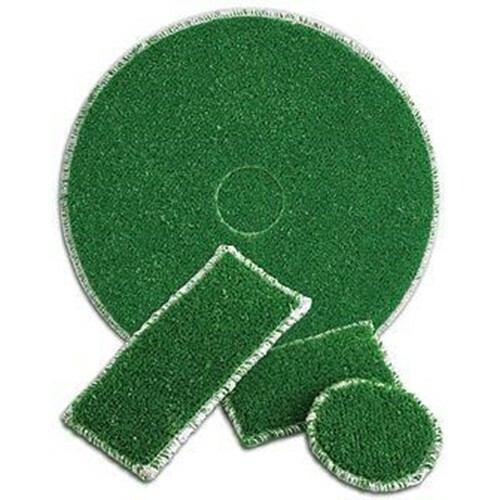 Brush-Pad is unbeatable for auto-scrubbing and disk scrubbing of abrasive floors, grouted tile floors, terrazzo, poured non-slip floors, concrete floors and other uneven floors that would normally require a brush. * Ruff?? is light weight, flexible, easily switched for regular floor pads and is much less expensive than a brush driver block. * Aggressive but not abrasive. * Serged to secure the edges. * A pad that goes where only brushes used to go on rough surfaces that would tear up a floor pad. * The porous materials allow liquids to pass through to the surface for use with autoscrubbers. * Thousands of brushes laminated to a floor pad driver. * Ruff?? is packed 4 per case and comes in all standard floor pad sizes.